Small batch production by all of our food makers is deeply valued at Manhattan Fruitier. We are always on the lookout for those who put thoughtful craftsmanship and quality of ingredients first and foremost. Since we first opened 26 years ago, Shelburne Farms has made many, many small batches of amazing award-winning farmstead cheddar for our gift baskets – as of this week and counting- we figure around 22,767 lbs. – about 11 ½ tons! So, that’s a lot of cheese. As we delve into such a weighty topic, we called on Kate Turcotte, head cheesemaker at Shelburne Farms, to give us a closer look at their process of making farmstead cheddar, life on the farm, and a bit of Shelburne’s grand agro-educational mission for a sustainable future. But first, imagine the farm, on a 1400-acre picturesque bluff overlooking Lake Champlain in Shelburne, Vermont, a farm that began over 100 years ago and was designed to be a model agricultural estate. In the early 1970’s, family descendants of William Seward and Lila Vanderbilt Webb made a brave decision to turn the property into a non-profit, farm-based educational organization focusing on land and conservation stewardship. 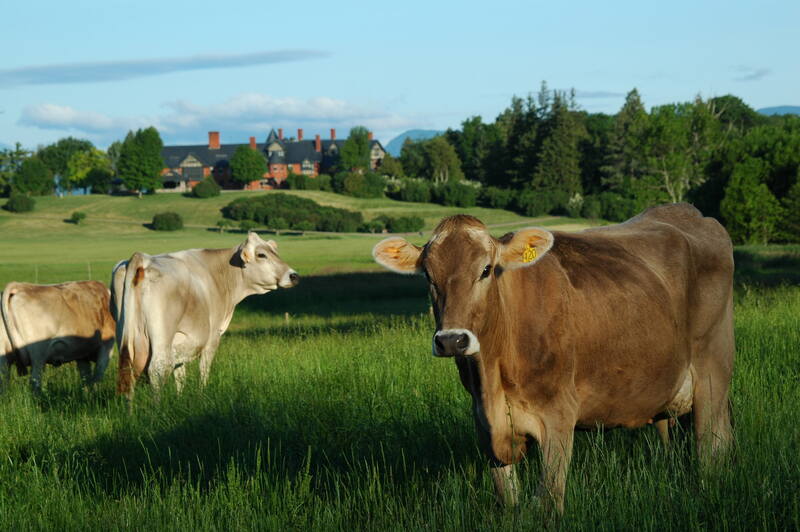 Shelburne Farms is one of the first farmstead cheesemakers in Vermont and the first Certified Humane grass-based dairy. That’s quite a statement of quality. Grazing Brown Swiss cows at Shelburne Farms. Photo by Vera Chang. You started at Shelburne Farms as a milk hauler 7 years ago. Not many people can claim that job title. What did that entail? Kate Turcotte: It was basically hauling the milk from the dairy to the creamery. They needed someone who could drive a tractor and I grew up on a working farm so had lots of experience. I would come in at 7:00 a.m., ride the tractor down to the dairy, pump the milk into the bulk tank, take the milk to the creamery, and finish by washing everything down. That was my start at the farm. 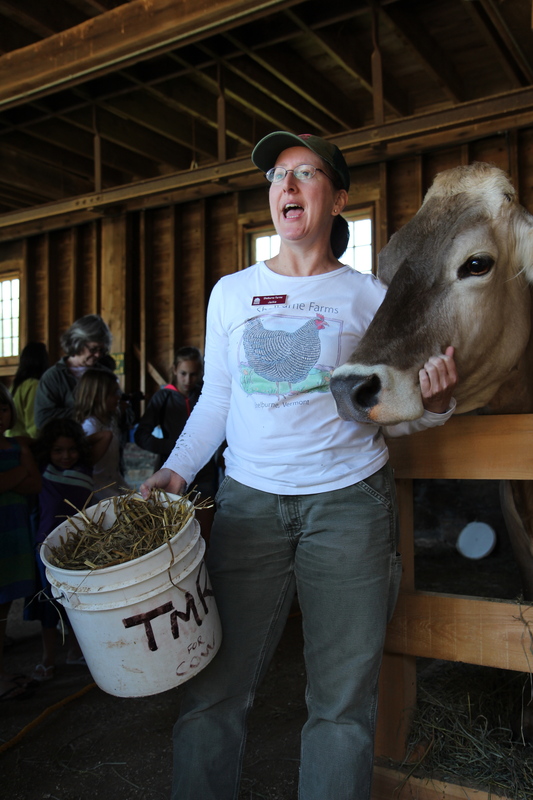 Shelburne Farms Head Cheesemaker, Kate Turcotte. Photo by Vera Chang. Describe your journey from Milk Hauler to Head Cheesemaker at Shelburne Farms. Soon after I started, a cheesemaker left and I found myself cleaning and assisting on random projects. When I returned the next season after school I had developed an interest in learning how to make cheese, and convinced the Head Cheesemaker at the time to teach me. She took the time to train me over the next four years, summers and weekends, as I was still a college student. As the years rolled by, I developed a desire to dive a little deeper into cheese making, so I went to Consider Bardwell farm in West Pawlet, where they make great cow and goat’s milk cheeses. I stayed there for 2 years and when the Head Cheesemaker here took a job at Jasper Hill, I returned to Shelburne Farms. What initially drew you to cheese making? I studied agriculture in school, always thinking I would be a dirt farmer. I wanted to be involved in vegetable or fruit production, with a strong desire to create a high quality product. Whether it’s a carrot or a piece of cheese, it’s something that I always knew I wanted to do – a chance to combine my love of cooking and making food and being on a farm. Everyone has tasted cheddar but most people know very little about what is involved in its production. They know it’s made from milk, but the recipe and process can be quite mysterious to the layman. Explain how you transform milk into cheddar. Basically all cheesemaking looks very similar, up to a certain point. If you look at the ingredients of most cheeses they’re going to be the same – milk, starter, rennet, and salt. One of the most fascinating things to me is how all cheeses can have bits of the same ingredients but there is so much diversity in the end product. With cheddar, we do an evening milking and a morning milking. The cows have just left the line so it’s very, very fresh and we’re awaiting the haul truck to pick it up. We put the milk into our vat and heat the vat to the right temp, so the starter culture will be active and do its thing, and now we are beginning to create a preserved food product. We’re basically trying to make milk last for years, so starter culture helps with that, along with many other things. From the starter culture we add rennet, which coagulates the milk and turns it into curds and whey, and that sets for a bit. 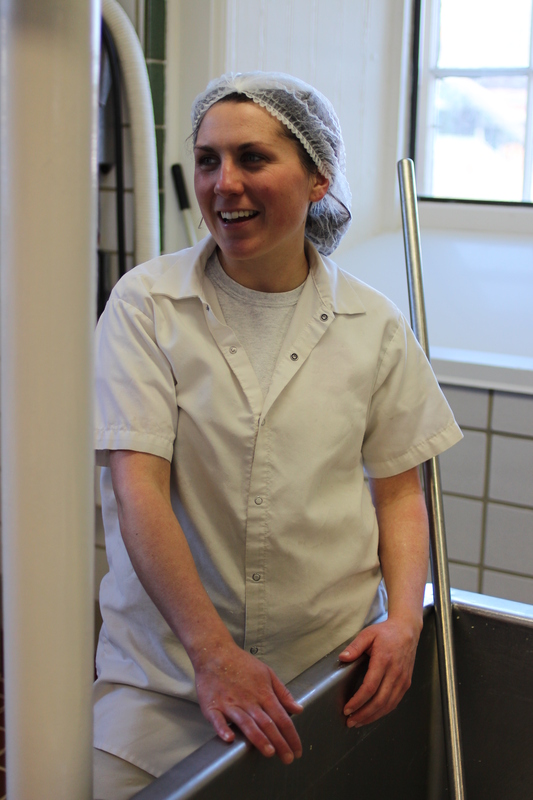 Shelburne Farms cheesemaker Megan Holt. Photo by Vera Chang. What makes cheddar “cheddar” is that once we drain the whey, we’re left with just the curds in the vat, which we then put into a “pack”or slab. We place these packs in two large piles with a trench in the middle and the curds just naturally mix together to make a fairly solid piece of cheese. Then we cut the cheese into slabs and begin the cheddaring process. In our world, cheddar is a verb, where we stack these large slabs of cheese on top of each other and over a period of time, cheddar is created. Kate busy “cheddaring”. Photo by Vera Chang. Cheddaring creates the texture, that acidic kind of sharp taste, where aging is very, very specific to this cheese. Once the slabs are done cheddaring, we make sure it has arrived at the right P.H. Then it is put through a mill and basically chopped up from big slabs into tiny, little curds, you know like the kind you find on poutine. We take those little curds, salt them, put those cheddar “fingers” into hoops and press overnight and the next morning we’ve got a 40 lb. block. This is a very simplistic version of how it’s done. Dressing the hoops which create the 40 lb. blocks of cheddar. Photo by Vera Chang. How do you create “sharp” and “extra-sharp”? Is it purely by age or is there something more? It is by age. Every single day we have a goal of making our signature cheddar, the same exact cheese. However, it’s a raw milk cheese product and we’re also human and not robots. Sometimes the next day after a batch we do our test and notice that it’s aged out pretty well based on salt, moisture and ph. But some days, due to refrigerator space, for example, we may age it for 6 months vs. 2 years. That cheese will be less sharp. The sharpness is also a combination of many things – the breakdown of protein, fat, and lactic acid being produced – certainly a 2-3 year cheddar will have more ‘sharpness’ than a 6-month aged product. What makes Shelburne Farms cheddar recipe special and stand out from other cheddars? The fact that we hand cheddar, the traditional, English cheddar way. Other places that do a stirred-curd cheddar, done by machines, cannot get the same texture and consistency. Our method of cheddaring- flipping and stacking the slabs is labor intensive, all done by hand and a much smaller scale of production. That makes Shelburne Farms cheddar unique. And I would say the fact that we are farmstead. Which means we have our own herd here. We drive our tractor down the hill to pick up the milk and it’s really high quality raw milk. To be able to have our own raw milk, it’s pretty rare. Close up of cheddar slabs. Photo by Vera Chang. What distinguishes a Vermont cheddar from a Wisconsin cheddar? Is it truly a difference of terrain that the cows eat? Something more? Because of our Vermont landscape, we’re in mountains so farms tend to be small. We can’t have very large dairies here because we don’t have that immense open space. So, historically and even today, farms in Vermont, whether vegetable, cheesemakers, or dairy, are a lot smaller compared to places in the Midwest. We don’t try to compete with that. We’re doing something different here in Vermont. We were very proud that at the American Cheese Society awards held in Wisconsin last year, we won 2nd place for our 2-year cheddar. I’m sure there were a lot of Wisconsin people who didn’t appreciate losing on their home turf. You spend your days making cheese on one of the most beautiful, idyllic farms in Vermont, if not in the country. Give us a feel for what it’s like to work in the gorgeous farm barn at Shelburne Farms. It seems like a really unique place to work. I remember the first day driving up to the farm for my interview, in awe when I turned the corner and, all of a sudden, there’s this castle in front of me. I still feel that awe, 7 years later, and I think it’s one of the reasons people work here. The Farm Barn. Photo by Marshall Webb. Our cheesemakers are just so amazing and so dedicated. It’s really hard work – a lot of cheesemaking is just glorified dish washing. But to be able to leave work, walk around the property, and be able to participate in all the events here – that’s something that rejuvenates you every single day you come to work. 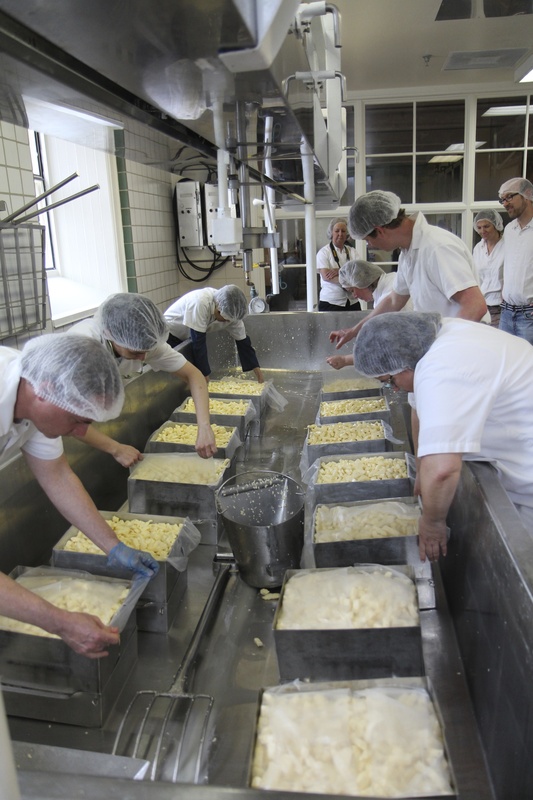 What’s a day in the life of a cheese maker? It’s a lot of washing. There’s usually a lead cheesemaker, in charge of that day’s make, driving the recipe, making the decisions, and another cheese maker brings in the milk, does the testing, assists during labor-intensive parts. It’s a lot of washing, a lot of heavy lifting, listening to cool music, mostly the business of making cheese. Cheesemaking at Shelburne Farms. Photo by Vera Chang. As amazing as your cheeses are, they are only one piece of what Shelburne Farms is all about. What is the wide-ranging mission of the farm? Obviously, there are many, but the cheese making is a part of the larger mission of education and stewardship of the land. When we make cheese, there’s people visiting from all over the world, and school children too. We bump into the ‘mission’ every single day. The profits of cheese making directly fund the larger mission of the farm. Whether it’s the inn or the restaurant – everything – it’s all one common mission of maintaining this beautiful place. Keeping Shelburne Farms alive and open, educating future consumers and farmers is the overall mission. Learning about where milk comes from at the Children’s Farmyard at Shelburne Farms. Photo by Vera Chang. With Shelburne Farms 40th anniversary coming on, what do you think is its greatest or proudest accomplishment? From my perspective, probably the decision by the owners in its early history, to make a critical decision on the future of the farm, deciding to preserve its heritage and create what it is today and not pass over this prime real estate to developers. That took courage, and this family is still here today, working hard to live out their vision. What’s the most popular product you produce? Which one gives you the satisfaction to create? People know us mainly for our one and two-year aged Cheddar, our flagship. We also sell a Tractor Cheddar at the farmer’s market and at our store. It’s like the most stinky, sharpest batches that may not be in our flavor profile, but still a pretty good cheese – like old-time Vermont Cheddar. I remember giving it to a kid once in a farmer’s market and the kid started to cry because he said it hurt his mouth! That’s the kind of Cheddar that it is and I think the locals really identify with that cheese. It’s what they think of when they think of Vermont Cheddar. 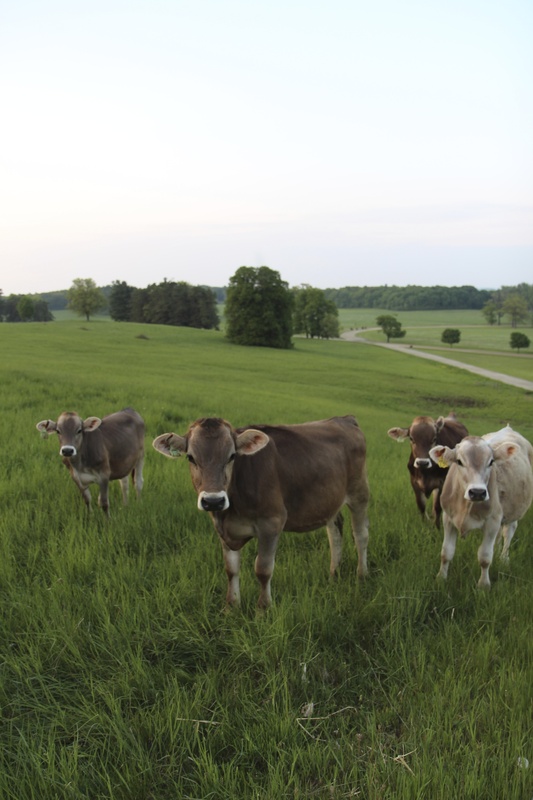 The Brown Swiss cows at Shelburne Farms produce all the raw milk for your cheddar. How many are there? Share a story about the personalities and life of these beautiful cows. Brown Swiss Heifers at Shelburne Farms. Photo by Marshall Webb. I wish I had more interaction with the cows. Our milking herd numbers about 100. Just today we were all down cleaning up the dairy, getting ready to make cheese soon, and were talking to Renee, the herd’s manager. Every year they pick a theme to name the cows, for example they might choose baseball teams and name all their calves that have been born that year off that. We were bantering about different ideas for this year. Everyone in the milking herd knows every cow, their names, how old they are, who was born in the same year (based on the names). Anyone who visits can attest to just how beautiful these animals are. I can’t imagine Shelburne Farms’ landscape without them. 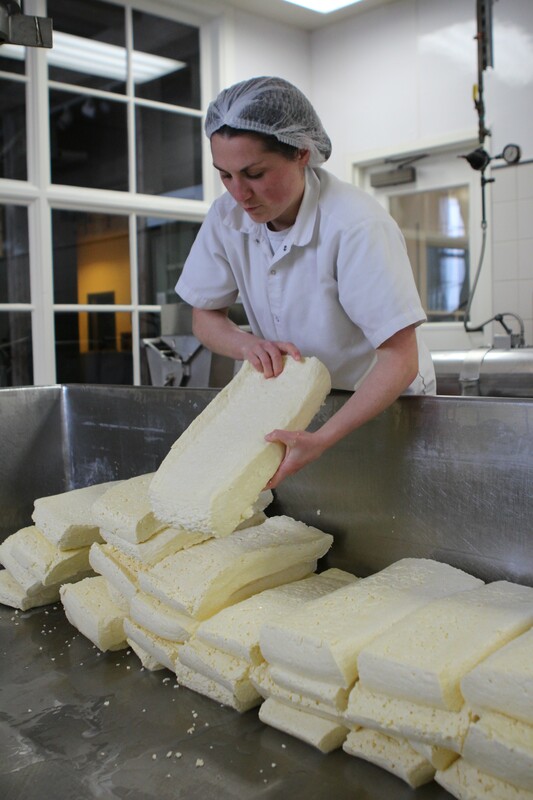 It’s such a privilege to make cheese from their amazing raw milk – it’s just great for cheese making. 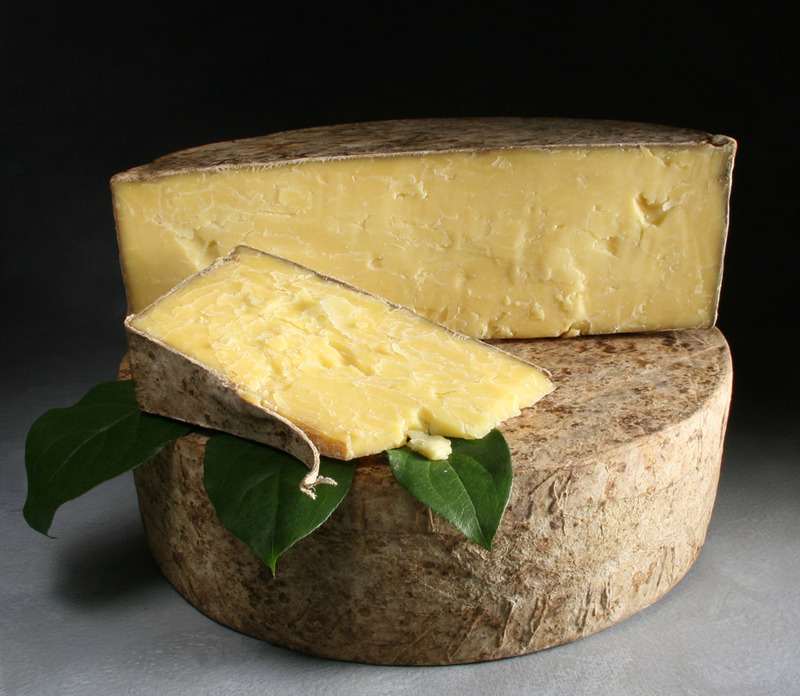 What are the differences between block cheddar and clothbound cheddar? The majority of our cheeses are block cheeses. However, once a week we make our round wheels and we take those curds and instead of putting them into the normal 40 lb. block wheel, we put them in a type of mold called “Daisies”. A lot of focus of cheese making is put on what happens in the vat – but there is also the other stage – aging. So the curds are made the same exact way but they differ in that one goes to wax wrap and the other gets cheesecloth and lard and gets sent up to Jasper Hill and cave aged. Just a couple days ago we went to Jasper and tasted our cheeses and it was incredible, just how that different environment creates a completely different cheese. So, the clothbound cheddar is going to be a lot dryer, and will age a lot faster, just because it’s exposed to the air. It has a mustardy, oniony kind of taste whereas our other cheese doesn’t necessarily develop those same type of flavors. It’s all based on its aging environment. Why do you send your clothbound cheese to age at Jasper Hill, instead of doing it yourself? We did do it ourselves for a very long time, but decided to focus on making our block cheddar every day which is what we do best. Clothbound is something traditional, and while we do enjoy that part, cave aging, having one person dedicate a whole day to aging our clothbound just isn’t economical. Also, it’s Vermont and we’re all like partners in this big project at the cellars, and we want to support what they’re all about. All of our four cheese makers were at Jasper’s the other day and it’s like going to cheese university. It’s really incredible, learning from them and we just wanted to be a part of what they’re doing. And, our quality of cheeses dramatically improved because it’s hanging out there with the Cabot clothbound, and there are people that are trained affineurs, so they do what they do best, and we’re doing what we do best. A great partnership. How much does the flavor vary from batch to batch, season to season? I think flavor changes so much, and from day to day. You can visually see it, as in the color, the fat and protein levels change, so that obviously changes the flavor. All our cows live on grass and in the springtime they are eating from pastures just full of every type of spring bloom. You can look down at a square foot of pasture and there will be 75 different plants there, and take a look at the same square in the fall and there’s 20 types of plants there – that all develops the flavor in different ways. I think in the springtime you just have fruitier, brighter, more complex flavors, and in the winter, it’s a brothier, beefier kind of flavor. What foods and drinks pair best with your cheddar? I personally like I.P.A.’s. Up here, everyone’s always talking about Heady Topper from The Alchemist Brewery. That’s a really strong double I.P.A. I believe you want something that can stand up to the cheddar. Our cheddar has a lot of flavor so you want something that can hang around that, anything that’s kind of beefy, like a bold red wine or a strong I.P.A. The thing about cheddar – meats, fruits, everything – just kind of goes great with it. But if you get one of our three-year cheddars with Heady Topper, that’s like heaven, right here. A perfect pairing of beer and cheddar. Photo by Cheese Chick Productions. What’s in the near future for Shelburne? Are you developing any new cheese or different ways of treating the classics? 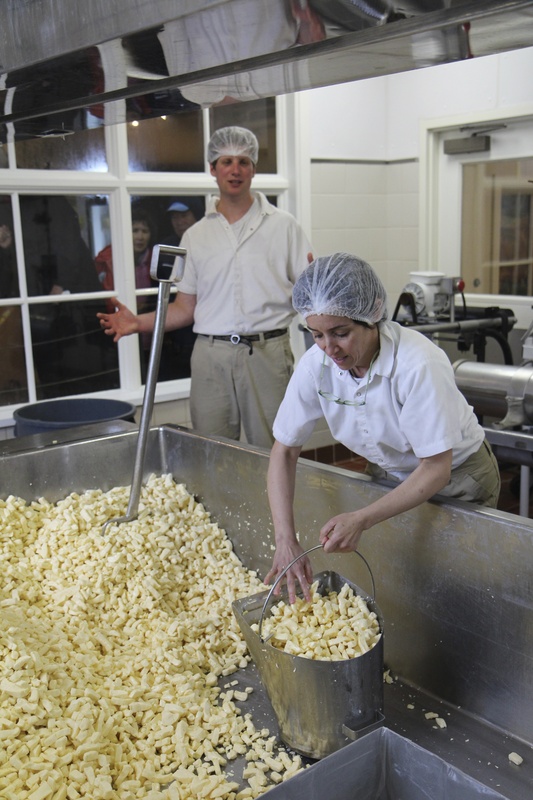 At Shelburne Farms we like what we do – cheddar – we like to do just that and we do it very well. 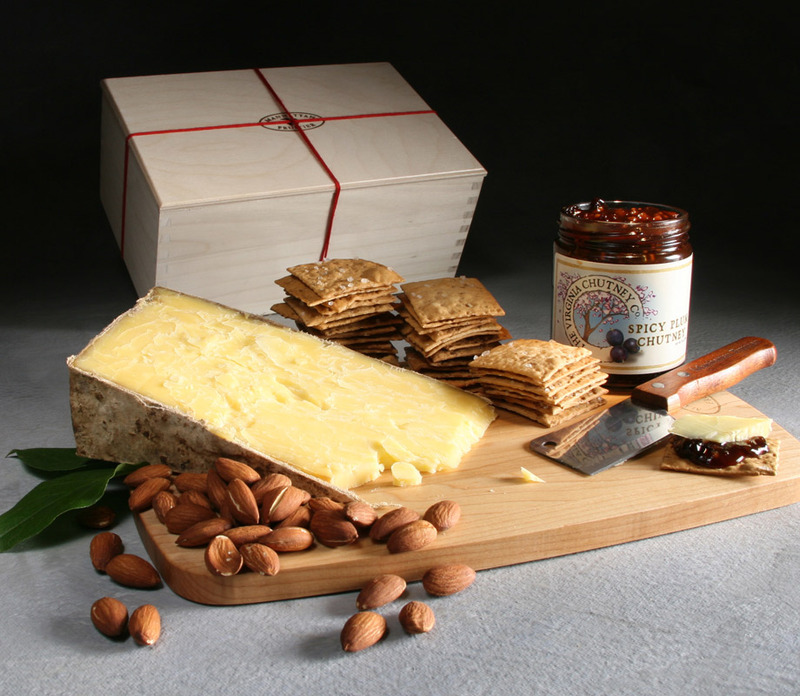 We are definitely interested in the partnership we have with Jasper Hill and our clothbound cheese, we will continue to do more of that. 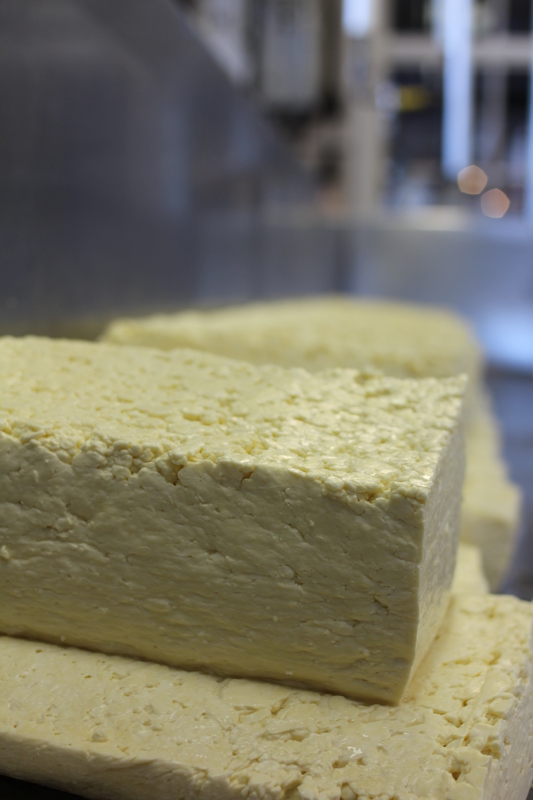 Our goal is to continue increasing our production and tweaking our recipe to make the highest quality of cheese. What’s a good day at Shelburne Farms? A good day is a summer day. We have a really great sound system and we’re all really into listening to good music, so there’s probably a good playlist on. Hopefully, we are outside for lunch to enjoy the beautiful farm barn. And, everyone here really gets along with one another, so if we make an awesome batch of cheese that’s going to be a perfect 3-year, a perfect 10 on our scale, we all go down to the lake for a swim! Do you ever take time to reflect on the satisfaction of knowing the cheeses you create are being enjoyed around the country at this very moment? – it still blows my mind. I’d just like to emphasize that it’s such a team effort at Shelburne Farms. We four cheese makers in the dairy are just a part of the process. From the farmers to the Cheese and Catalog staff, all the way down the line. You know, a lot of emphasis can be put on the cheesemaker or the cook but there are so many pieces to this cheddar puzzle. We are lucky to have an amazingly solid team putting it together. We have known Katie Turcotte all her life, and are very proud to see her success in the cheese world of Shelburne Farm.